Please welcome Tina and her pets!! Hi everyone! 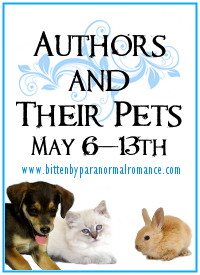 First I’d like to thank, Bitten by Paranormal Romance, for the opportunity to stop by and introduce my furry baby to everyone. This is Bela. We call him our one-eyed, cycloptic cat. 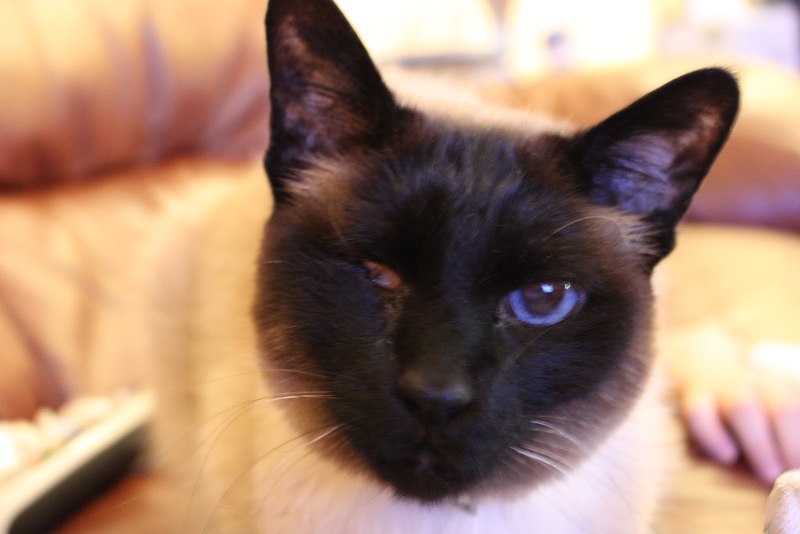 Bela is a Seal Point Siamese and will be 14 next month. I’ll never forget the day we bought/rescued him. At the time, we had a Chocolate Point Siamese, Mr. Viv, who passed away two years ago at the age of 21. He was getting old and lazy so we wanted to get him a companion to play with, hoping it would get him off the back of the couch. I’m in love with the Siamese breed and searched my local rescue shelters for them first. After having no luck, I searched the local newspaper and when I saw an ad in the paper for Siamese kittens, we were off to find a new addition for the family. I was shocked when I arrived. The ad didn’t lie. They had kittens there—tons of them. Kittens with weepy eyes and fur matted with fleas were scattered around a tiny room. Dogs could be heard barking in the garage, and I was sure that Cujo was going to come crashing through the wall at any minute. At this point, the only thing I was committed to doing was turning her in for being a pet mill. That’s when this little cat, about one year old, jumped up on the counter in an attempt to find water. He looked at me with his one eye and snaggletooth with almost a pleading expression on his furry face. I turned to my husband, and he knew right then, we were not leaving without that cat. He was nameless and filthy with earmits and fleas and he had an overly skittish demeanor. Once we got him home, I stepped into the shower with cat in hand and started scrubbing him down. He screamed the entire time. Oh… and, he LOVES cheese. Yep, he can hear the cap pop off a can of Cheese Wiz a mile away and loves Colby Jack. He loves music that is played softly and he’ll flip over on his back and hams it up when I sing, You Are So Beautiful, to him. As you’ll see in some of the pictures, Bela also loves to camp with the family. Bela has kept me company many late nights while I write and the rest of the family sleeps. He’s made crucial decisions with me as if a character should be killed off. Paw up… the character is a goner. Bela has his own starring role in my books and now thinks he’s king of the jungle. At least he only wants to be paid in cheese. I hope my Bela brings a smile to your day. PLEASE SUPPORT YOUR LOCAL ANIMAL RESCUE GROUPS. 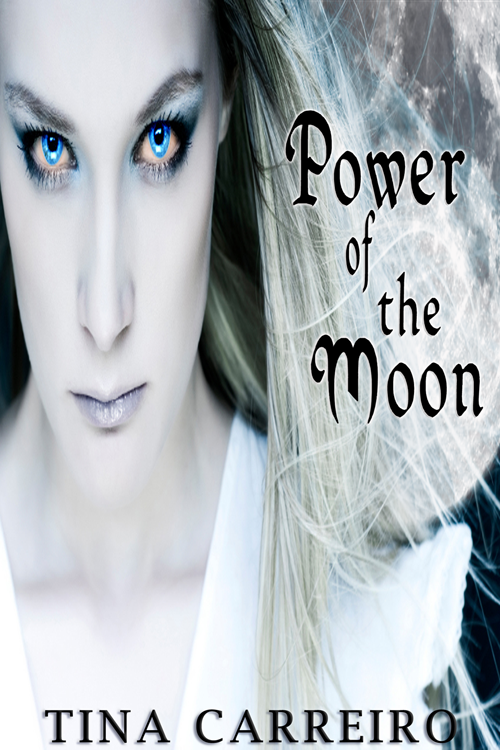 Tell me what your favorite cat breed is and one lucky winner will be entered to win my book Power of the Moon when it is re-released into the reading world. In addition, two lucky winners will receive SWAG!! ^^ let's be honest when my dog started to bit his pawn until they bleed and didn't even stop there because the cat he was seeing sometime s( like once a week at most)left to die somewhere i decided to take him a new cat friend but one really our own this time. The rule i put myself was " a female ( hoping my dog would be more happy that way, no alpha clash) and no siamese ( fault to disney " la belle et le clochard" - hate both siamese in this film) after searching a lot because i don't want to buy an animal ( that way i know they are loved and not just money thing we found a small one, my father being very ill the kind woman agreed to drop it while going to work. The next day i found myself with a small thing in my arm purring like there was no tomorrow... i should have guessed there was a catch then ^^;; because i always has difficulties with female cat never male. My favorite car is a Dodge Charger, and my favorite cat is Calico. We aren't big pet lovers here, (at least I'm not). We have a few fish and a frog, easy upkeep. Glad to finally see pictures of the infamous Bela. I love Calicos. I had one when I was little and I have one now. They are so pretty and petite. And all they want in the world is just to snuggle. Mine even sits on my feet when I'm at the computer (like right). I had a big gray tabby cat that was enormous. He wasn't fat, he was just a big boy. The vet said he was just built to be a massive cat. Unfortunately he also got diabetes. We were able to do shots twice a day for several years. He was our puppy/cat. he played fetch too, and would bring a ball to me to play. He was clumsy and silly and we loved him. We were blessed to have him as long as we did. My favorite cat breed is a Bengal. I have two named Max and Harley. I once read a quote somewhere..."God gave us pets so that we could learn to love and learn to have patience, so when we someday bring children in the world, we will be prepared." I agree with the quote for the most part. If you can open your heart and love a pet then loving a child will come naturally. But sadly this doesnt follow for everyone. Thanks for sharing, Tina. I love the Siamese breed too, but I'm partial to the rescue breed. Any cat or dog in need of a home can find it's way into my heart, especially if he or she is older and considered unadoptable. A long while ago, I used to raise both Siamese and Abysinnians. Not anything like the kitten breeder you encountered! We only had one female of each and had them bred once a year. Both moms and kittens were well-loved family members, and we made sure the kittens went to good homes when they were old enough. Now with so many mixed-breed cats available for adoption, I can't bring myself to raise pure-breds anymore. Our "ordinary" spayed cats bring us so much joy! I really don't have a specific breed of cat that I love. I have had a bunch of different cats, generally all rescues/strays that I end up being a sucker for. I currently only have one, and he will probably be my last cause I seem to have developed an allergy to them. Mr. Whiskers is a gorgeous Tuxedo cat and a very spoiled. He also pretty much thinks he is a dog, he has been raised with dogs his whole life. I also do not have a specific breed of cat that I like I just like all of them. We live out in the country so there is not an animal shelter near us. All of our animals has adopted us. I have a calico female cat that wandered to our house starving someone had dumped her out near our farm. She came right up to me and I petted her. When I went to go in the house to get food she came right in and hasnt left since. We have another calico that came about a year later and she is an outside cat. She just had 6 kittens (another little surprise she had when she came to our house) four weeks ago. Then there is the black lab my husband brought home. He is a delivery driver and he was making a delivery and left his door open on his truck when he came back there was a dog in it. She did not want to get out and the woman said that their animal control was going to put her down that night because she was dumped there. He brought her home that night. Cat breeds are not as well known as dog breeds are, so my cat is categorized as "domestic shorthair" lol. However, my Mom once watched a documentary on cats and thinks my cat is a Singaporian breed or something due to her face shape. In any case, she's a little itty bitty black kitty :) And I loves her. I love all cats too, I had two white cats when I was little named Snowball and Snowflake. I have no clue to what breed they were but loved them to pieces. When I was a teenager, I had my Onyx. She was a black Persian. I love all animals and my heart goes out to all neglected, abused, abandoned, etc animals which is why I volunteer at my local no-kill shelter. As far as cat, Siamese have always stolen my heart. We had two when I was growing up. That is so strange. I too have 2 seal point Siamese cats that are both blind in their left eye and I rescued them from the same environment! The only difference is that mine are long haired. Bonnie is more standoff but Clyde seems to be just like Bella. He thinks he's a dog and he follows me everywhere and I mean everywhere.